Definition - What does Tadasana mean? Tadasana is a simple standing asana, which forms the basis for all the standing asanas. It is performed at the beginning and end of the surya namaskara sequence and is a key asana for all yoga practices. It is a good asana for cultivating stillness, strength and a sense of relaxed power. It can be performed between other asanas to allow the mind and body to absorb the benefits of the previous asana and prepare for the next one. The English name for tadasana is mountain pose; however, in Bikram yoga it may be known also as tree pose. The name, tadasana, comes from the Sanskrit tada meaning “mountain.” In tadasana the intention is to cultivate the strength, stability and stillness of a mountain. A related term, samasthiti, means to establish an equal or steady stance at the front of one's mat while in tadasana. Tadasana is both physically and mentally grounding, and can be used to form a connection with the earth. It can be deepened by closing the eyes to challenge the balance further. The drishti, or focal point, for tadasana is the end of the nose, or nasagra drishti, which helps to make the pose more introspective. 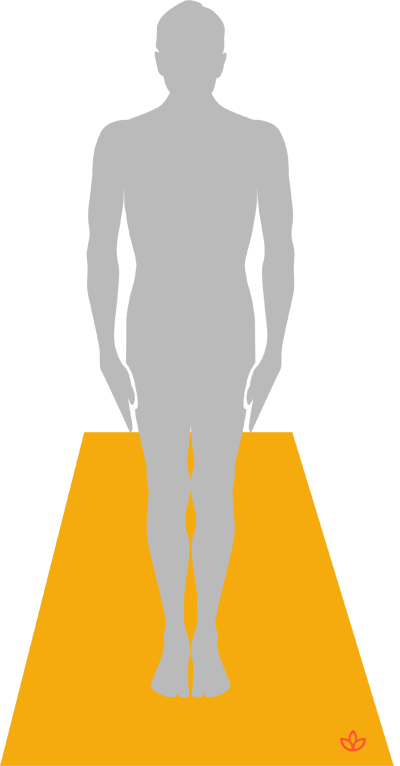 All three bandhas: uddiyana bandha, mula bandha and jalandhara bandha can be engaged during tadasana. Tadasana is considered a good pose for balancing the root chakra.